The MInelab E-trac is an advanced detector incorporating Minelab's Full Band Spectrum (FBS) technology and SmartfindTM discrimination. It's sleek, sturdy design, innovative control panel, intuitive menus, clear LCD screen, robust lightweight coil and comprehensive targeting options set the E-TRAC apart from other brands. E-Trac Xchange USB functionality – create, download and upload your E-Trac Settings and Discrimination Patterns for Users favourite sites; save to a PC and create a library of favourite sites or XChange them with others by email. Ultra-lightweight waterproof 11” Double D Waterproof Coil, versatile with sharp, accurate pinpointing and depth! QuickMask TM with independent Ferrous and Conductivity rejection level adjust – a fast and simple way to edit Patterns. SmartfindTM Minelab's proven unique discrimination dual coordinate target profiling. Discrimination Scale with radical realignment improves the target ID and recovery rate of good targets at depth. Sensitivity functionality with expanded Auto, Manual and “Suggested” settings. Refined Threshold adjustment level on a 1-50 scale – greater precision to suit User requirements. Pinpoint with audio and visual indicators on 2 modes makes target size and identification more accurate than ever. Four User Mode slots – personalise Modes to suit specific detecting target preferences and environment. Trash Density - High ensures fewer false signals experienced in high trash environments, Low is perfect for cleaner sites. User-centered Keypad and Menu Interface Design – enhanced usability with intuitive icons and logical menu sequences that are fast and so easy to use! Ergonomic, perfectly balanced Handle Assembly – designed to ensure longer periods of detecting without fatique! Additional Expert Features and Preferences allow E-Trac customisation to suit user needs. …and more!! Features and functionality information can be seen on the Product Brochure and Review (scroll and open PDF files). “Relic mode: Damn this is a good program! This is also the perfect base ‘Pro’ setting, the starting point for all really advanced programs. All I needed to do to customise the E-Trac to my style of detecting was to change ‘Sounds’ from ‘Ferrous’ to ‘Conduct’ and then add my own custom disc pattern. “Although I never used auto sensitivity on the SE, I’m impressed with the way this works on the E-TRAC, a great improvement." "The recovery rate is noticeably faster. I am really looking forward for the crops to come off so I can get this on my best fields." "I like the louder clearer signals to small target... I tested a cut quarter next to iron rejecting just 'nails' and the response was identifiable." "This evening I've been detecting on a site where the soil is more mineralised. In fact the performance of the E-TRAC was bloomin’ fantastic!!! It banged out loud clear signals on finds ... and the signal quality was a lot better on the deep small native targets with the E-TRAC (sharper and clearer audio responses)... some of the trickier SE signals just wouldn't have been dug if the E-TRAC hadn't already given positive signal on them." Minelab have listened to customer feed back and addressed issues such as weight and balance which is now near perfect. The Control panel and menu initially look daunting but are surprisingly straight forward and intuitive, it almost leads you to where you need to be. For that reason this the one top of the range unit we can confidently recommend to a beginner as well as the seasoned enthusiast. (In fact the only reason we would not recommend this to a novice is that experience of other metal detectors is advantagous simply to understand how good the Minelab actually E-Trac is!) 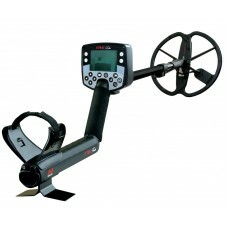 Having clocked up many hours use with a Minelab E-Trac to say we are impressed is an understatement. *UK Mainland only exc Highlands and Islands - call for details.